My eyebrows had raised at reading the comment, but I was not terribly surprised. 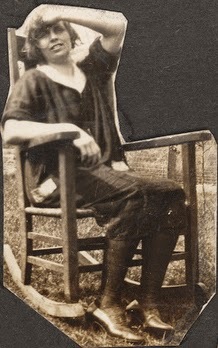 Jennie Rosa had left her husband, Abram, during the war, with their two daughters. Never to go back to Michigan again. My belief was that she left him because of possible abuse. Of course, it is doubtful we will ever truly know. Found in the In Court section on page 5. Joseph would have been 35 when this occurred. The Wellington Cross mentioned in the article was his sister Sophia’s 22 year old son, his nephew. I have a hard time believing that Joseph had nothing to do with the larceny, he was much older than his nephew and was probably a very bad influence. Further investigation into Wellington shows him in court over the years for burglary and larceny at various times. It appears he had light fingers. I can find no evidence of Joseph in court again, but that could mean he just wasn’t caught or I don’t have access to all the newspapers. So now we have a better idea to why the community was leery of the Rosa’s and their kin. Abram was possibly abusive and his nephew and brother were crooks. 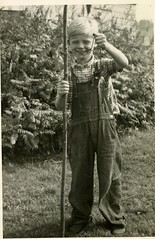 Who says genealogy ain’t fun. Now I need to see those court records. Yesterday, while doing research on Mary, Elzy George’s wife, I decided to try and find information on her through their children. 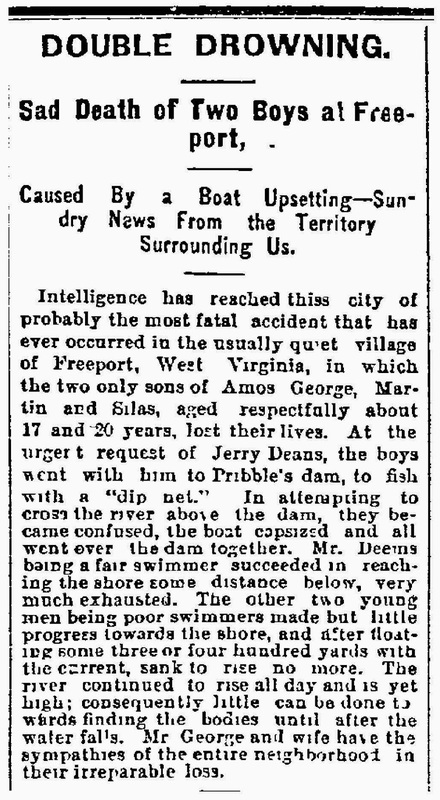 So I started with the newspapers, hoping to find obituaries that might be of assistance. These two boys were the sons of Amos and his second wife, Lydia Jane Glover, the boys were both 13 or less in age. My great grandmother, Rachel Hays, was named after her grandmother Rachel George Hays, who had died around 1900. My mission for the past couple of years has been to find out what I can about Rachel George’s family. It has been a very interesting journey so far. Using land records and online trees, that are of course not sourced, I have been able to piece together some parts of the puzzle. In fact one recent re-discovery, helped fill in more of the missing spots. The current belief is that Rachel George is the daughter of Elzy George and Mary (possibly Baker). Elzy was the son of William Absalom, jr., and Margaret and the grandson of William, sr. and Debra Ankrom. The Ankrom’s are of Scottish descent. The Georges were probably Welsh quakers, I am still working on that. I know most of this through my own research into the census records and land records and a few printed genealogies. But the big find for me, was a better confirmation that Rachel’s mother’s name was Mary. This happened when I was going over an 1870 census, a record I have had for several years, but until only recently understood the significance of. 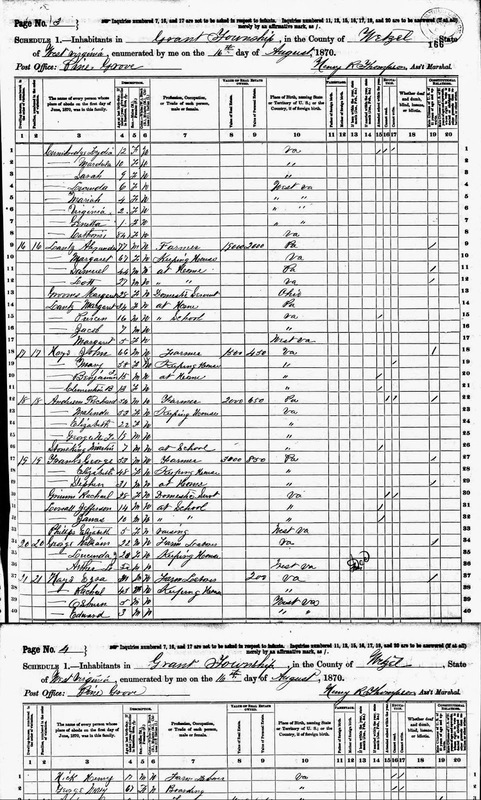 When I transcribed the census record into Ezra Hays record in my genealogy file, I had a Mary George age 16 living with Ezra and Rachel Hays along with their two sons, Edmund and Ausborn, and a farm helper. I thought that Mary was probably a niece of Rachel’s living with the family. However, while doing some recent census research for Mary, up popped this same census record which I didn’t remember I had. Only now I am looking at the actual image, and I see that the Mary listed, who I though might be a niece, was a 67 year old lady. Oh my goodness, this was probably Rachel’s mother. Which would make sense because she was a widow in the 1840s and had never remarried. So I had either transcribed the census record incorrectly, had a typo, or the earlier image had been hard to read. This is an excellent re-discovery and swings the consensus of Rachel’s parents being Elzy and Mary more into the yes category. Earlier census records for the Elzy George family also indicate a connection because there is a daughter of an age of Rachel in the both the 1830 and 1840 censuses. 1870 Census records from Ancestry.com from Grant, Wetzel County, West Virginia. It covers two pages and Mary George is on the second page. When Rachel was about 20 years of age she had an out of wedlock son, William George. We don’t know who his father is, as he is never named in any of William’s official records. This son lived by his mother and her new husband and sons, married, and had children of his own. It is like pulling teeth on this family, but that is what makes research so interesting. I will be doing more GEORGE research in June when I head over to Salt Lake City again. Here’s hoping. 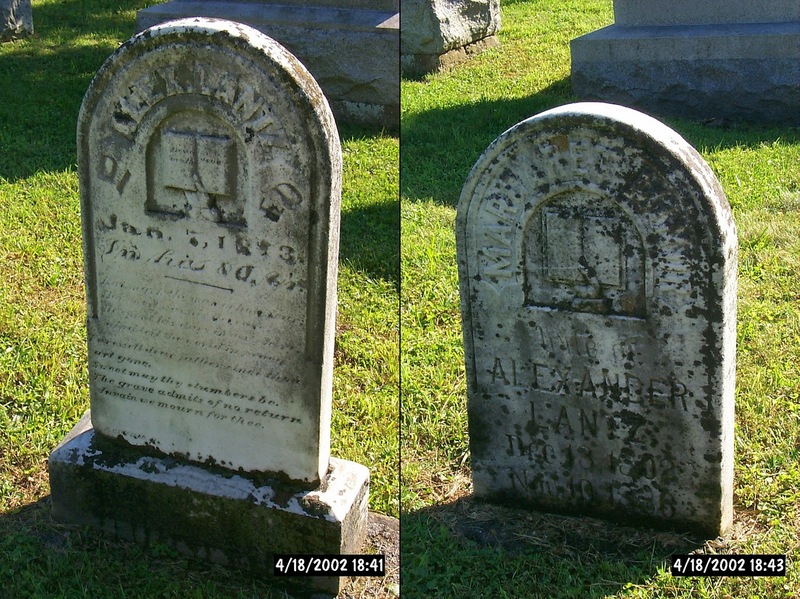 Alexander and Margaret (Minor) Lantz headstones in Jacksonburg, West Virginia cemetery. I bet you thought all our German ancestry came from our John side of the family. Well, surprise, you would be wrong. Susanna Lantz was born on the 18th of April 1820 in Pennsylvania. She was the daughter of Alexander Lantz and Margaret Minor. At the tender age of 16 she married Edmund Hays in Virginia. Susanna’s father’s family was all German. Her maternal great-grandparents came to America about 1748 and her paternal great-grandparents arrived about 1747. Susanna Lantz’s family tree, showing her father’s German heritage. The Lantz surname is found quite a bit among the Amish in Pennsylvania, I do not know if our Lantz’s were Amish, but if they were, they didn’t stay that way, as later generations didn’t appear to be so inclined. Alexander’s parents were Johannes(John) Lantz and Barbara Waggoner, which was Wagner in Germany. John served in the revolutionary war, in Capt. Henry Rush’s company of the Bedford County Militia. 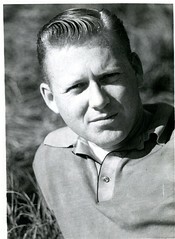 His name appears as John Lance in the official records. Alexander’s mother, Barbara, lost her father when she was 7, to what was believed to be a Delaware/Lenai Lenape raiding party. Her father Wilhelm Waggoner, was out in the field when he was caught and scalped. Barbara’s sister Mary, was kidnapped along with her brother Peter. However, Mary was killed by her fiancé during a very inept rescue attempt. Peter disappeared around the Great Lakes area for years, but eventually made it back to his family from Canada and took up shoemaking. Barbara’s widowed mother, Agnes (Fleisher) Waggoner married again to a Conrad Lutts. The George Lantz family first settled in Maryland around the Monococy River and then moved to the Shenandoah Valley. This is the first generation of Lantz’s in America. George and his wife Catherine were both born around 1707 in Germany. They had emigrated together along with a few of their children. This is the only bit of German that I have found so far on the Shepard side of the family, but that doesn’t mean there isn’t more. Esther Newell was dealt a double whammy in the world of history and genealogy. She was a women and she was crazy. Both of these issues made her doubly sure of not being relevant when it came to her descendants. One can tell how irrelevant she was by the dismissive mentions made of her in biographies about her husband, Asa Lyon. Esther was from Charlotte, Chittendon County, Vermont. She is said to have been born about 1762, although I have found no records that confirm this yet. She was the daughter of Rev. Abel Newell (a 1751 Yale graduate) and Abigail Smith (daughter of John Smith).1 She married Asa Lyon in 1796. They probably met in South Hero, Vermont, as he was employed there by 1794. I have found many mentions of him in various books published about the history of Vermont and South Hero. A great many accolades are heaped on him, but the only thing ever mentioned about his wife Esther, who birthed his children, is she was crazy. 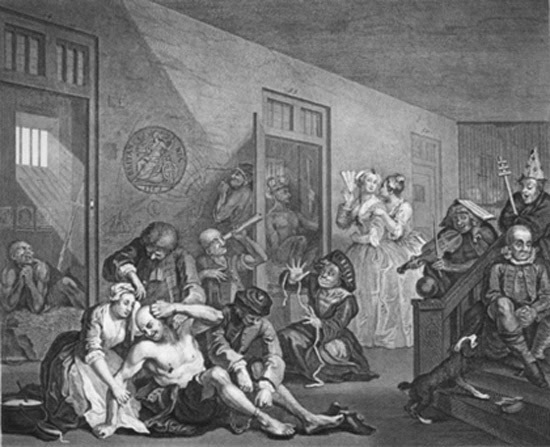 In researching the history of the insane in the later 1700s to early 1800s, I found out that there were only two institutions built around that time period in America, one in Virginia the other in New England. 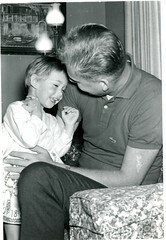 But from what I have been able to glean from various published biographies, Asa kept his wife at home in his own care. There weren’t really any other options at the time. And even if he could put her in an insane asylum, she wouldn’t have been any better off. The treatment of the insane was pretty barbaric at the time. The reason for the institutions in the first place, was merely a place to put the crazy people who were dangerous, so they wouldn’t interfere with the ‘sane’ people out in the world. Those deemed insane, but harmless, were left to their own devices. They ended up beggars, the homeless of their time. So poor Esther is treated with distain. It wasn’t like she had any choice in the matter when it came to being crazy, and we have no idea what kind of crazy she was. But she has been pretty much ignored even by those researching the Lyon family. Meanwhile her husband has had accolades piled on him by his peers, I am sure they were reasonable. Although one does get tired of the poor suffering husband routine. After all I do believe the vows were, ‘until death do us part’. He was merely doing his duty. I have to say that for me it is refreshing to have an ancestress who is a bit more interesting than the run of the mill housewife, which is 100% of the lot. I greatly wish more of them had broken out of the mould, even a little bit. Although I guess when I think about it, maybe they didn’t write a great novel or march for suffrage, but they did travel great distances across this country through the wilderness and help to carve out lives for their family. They crossed oceans in small ships leaving all they knew behind, in some cases not even speaking the language of the country they moved to, and suffered hardships beyond my comprehension or experience. I guess more of them must have been just a little bit crazy.